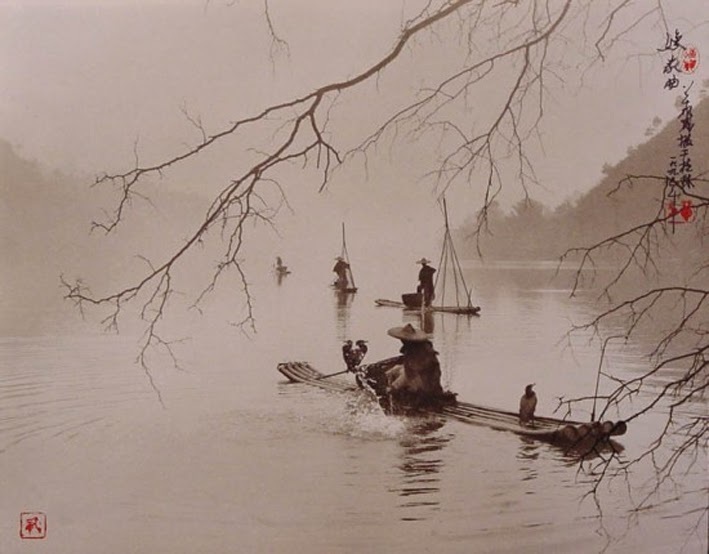 Originating in China, shui-mo painting was once deemed as a national craft. The craft is comprised of an exquisite blend of two elements, water and ink. The paintings are created using a brush, dipped into ground ink, then submerged in water before being painted onto a canvas of paper or silk. 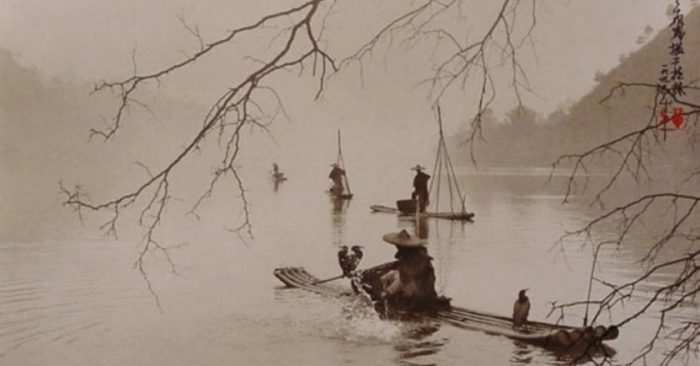 This is the reason for the monotone nature of the paintings, composed of just black and white. Having developed alongside Chinese calligraphy, shui-mo paintings often feature trees, flowers, landscapes, animals, birds and people… often accompanied by Chinese poetry. This style was once the traditional style of painting for Eastern people in general and was once common in Japan, Vietnam and Korea. Shui-mo paintings often carry within themselves the changes in mood felt by the painter. Feelings of subtle worry and deep thought are evident throughout works. It is in this way that the life of a person, a lifestyle or a way of thinking, through different periods of time, can be seen in each piece. Thus, the paintings are not only a work but also a manifestation of the inner soul of its painter. 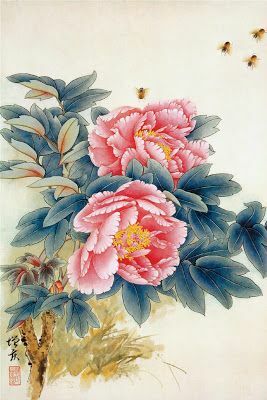 Shui-mo paintings feature a very unique style of art, that includes a harmonic composition of poetry, calligraphy, drawing and artist seal. In order to create a perfectly executed painting, the lay-out plays a very important role; a shui-mo painting requires an extremely elaborate and meticulous lay-out. Focal objects and the landscape are arranged in a harmonic manner, with a focus on the aesthetic, to obtain a balance to the painting. Nothing is too dark nor too bright, nothing too spaced out nor too concentrated. Thick heavy lines are balanced by soft light lines, these are then artfully contrasted against space to induce gentle and uplifting emotions. The clarity of a line indicates the depth of a painting and creates a sense of distance. Whilst the arrangement reinforces the feeling of depth, its primary function is to highlight the painter’s emotion. The painter needs to consider carefully whether or not to add a poem to the painting, traditionally written in calligraphy. Normally, a small blank space reserves the placement of the poem. Name, title and seal artfully laid out, would enhance the artistic value of the painting. It is said that poetry carries in itself the soul of the drawing, while the calligraphy is the essence of drawing. 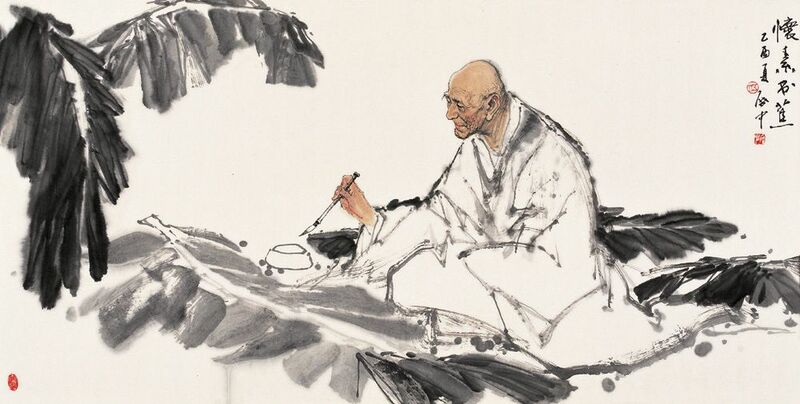 Through poetry, calligraphy and seal, the artist shows off his command of composition, his noble and profound conveyed thought and subsequently breathes life into the painting, full of individuality. An unique characteristic of shui-mo painting is its very loose connection to reality. The art form does not put a high importance on a precise depiction of a real scene or object. But instead on the drawing methods, including outlining, magnifying, breathing life into the painting, the artist’s individuality, through these emotion and feeling are conveyed through the painting. They are often improvised works, arising from the artist’s sudden inspiration when observing beautiful scenery. For such reasons, this type of painting is hard to copy or reproduce. 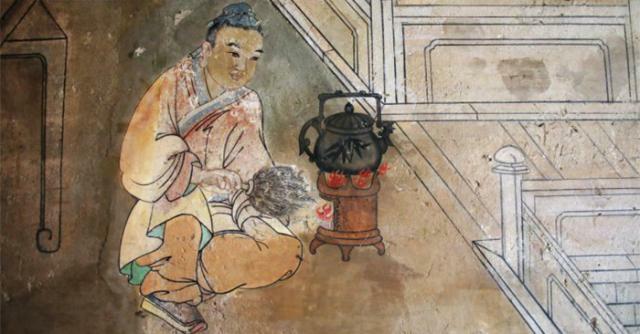 Shui-mo painters were very patient and paid high regard to mind and body cultivation. Rigorous practice along with mind cultivation are essential for artists of the past generations. For them, painting presents not only the beauty but also the painter’s intelligence, mind, realm of thought. Hence, the traditional art used to highly appreciate hard training and mind cultivation. Only artists who possessed characteristics such as patience, constant mind cultivation, tranquility and peace, nobility and virtue, would be able to produce works of profound inner meaning. ‘The five key elements’ principle is immutable, and consists of penmanship, lay-out, ink, color and spirit. The level of a shui-mo painter can be recognized by how skillfully they apply ‘the five key element principle’ in their painting. Artful penmanship, vivid shape, free landscape and soulful strokes show the artist’s dexterity in blending soul and color, content and form. Mastering these five elements breaths a life into the painting according to the painters own personality and thoughts. In order to produce a profound and soulful work, apart from mastering painting techniques such as shaping, and brush holding rules, adjusting force at the wrist, and utilizing the use of the fingers, the painter would have to constantly cultivate his mind to reach a high realm of tranquility, peace, nobility and virtue. 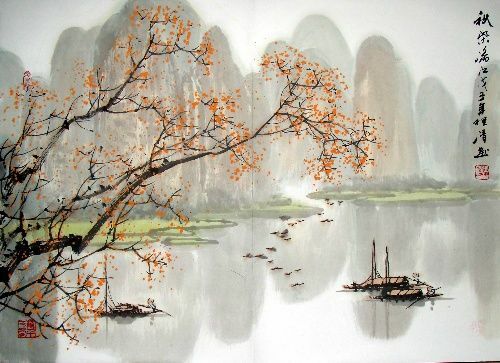 Shui-mo painting is usually done on xuan paper (a kind of high-grade handmade paper that is white and smooth) with the use of dedicated brushes and black ink. Upon having gained powerful inner force, a breadth of full emotions and rich ideas, only then does the artist start to paint on xuan paper. It is highly absorbent and no mark is able to be erased once created. Ink density would depend on each stroke and shape made by the artist, each motion creating astonishing changes to the painting. One school of Shui-mo is known as Realistic painting. It requires a highly detailed and extremely precise recreation of the view or composition of a painting. This penmanship is subtle but clear. The artist skillfully uses lines to sketch the frame of a landscape while paying the utmost attention to every detail of the scene and then colors them. Fresh and bright colored pigments used for this style are mostly made from minerals, that can retain the durability and brightness of its color for a long time. This type of painting was thought to be beautiful, elegant, decorative, and mighty therefore, it was practiced by artists working for royal court to depict the nobility of dynasties. The second school of Shui-mo is known as Implied painting. It is characterized by simple lines, sketching material and imaginary scenery. In the 19th century, artist Qi Baishi was well-known for this type of painting. 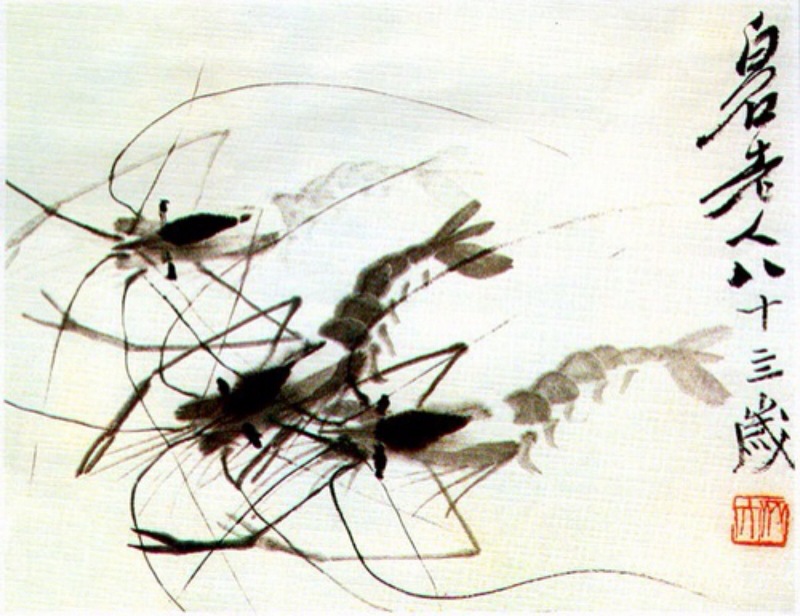 His pieces were fast moving and often depicted lively shrimp and moving fish. 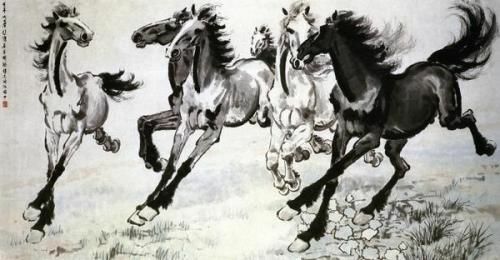 Artist Xu Beihong was made famous for his masterpieces on the study of horses in 20th century. Both had their own museums in Beijing. This style captures movement and pace, in a fluid and energetic way. Upon a recent return to traditional painting styles, we find ourselves attracted by the mesmerizing beauty of noble morality and the profound realm of thought portrayed by the painters. True art is a premier expression of the thoughts and mind of the artist. The beauty of an appealing painting does not only lie in the aesthetic aspects, such as color, landscape or artful lines but more importantly, deeply artistic values resulted from an ascending realm of thought.